Reflecting on introducing Anthony Bourdain to New Mexico. Because Tony Bourdain’s primary reason for being was to eat his way around the world, the places and cuisines he showcased all came to acquire a glow of the familiar for a global audience. 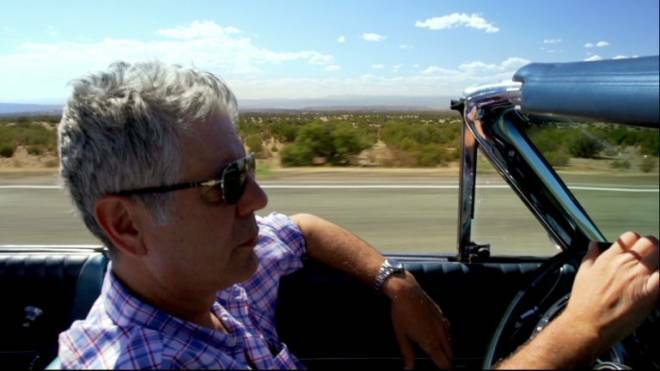 No one was surprised, then, when one of the first episodes of the second season of Bourdain’s Emmy-winning program, Parts Unknown on CNN, dropped the famous chef/author into Northern New Mexico. I got to be a bit more than a rapt audience, as I was one of the lucky people who got to engage with Tony Bourdain when Parts Unknown came to the state in 2013. Because both of us were writers, and readers, I even got to play a role in some of the ways that episode was filmed. In the wake of the news that Bourdain died, at 61, of an apparent suicide while filming for his show in France, I&apos;ve been reflecting on his time here. More than one friend over the years has inquired, not always incredulously, just how it happened that I ended up as one of Bourdain’s TV companions. Weren’t you living in Montana then? Have you and Bourdain long been friends? The answers: yes, although with a vacation house here, I was also a part-time New Mexican; and no, Bourdain and I had never met before. The truth was that I ended up on the show because a graduate student of mine had become a famous writer/TV personality. Steve wrote for Outside Magazine, whose editorial offices are in Santa Fe, so had stayed with me on visits. His show and Bourdain’s shared a production company, Zero Point Zero. Parts Unknown told Steve they were brainstorming a New Mexico show and asked him who he’d recommend to appear with Tony. That spring of 2013, I had phone calls with Bourdain’s producer about locations, eateries, scenes, and appearing on TV without becoming a deer in headlights. The Parts Unknown shooting schedule was crazy. They had five days to shoot, then five days off. Film crews and locations people got hired from local talent. The New Mexico show featured seven scenes, and since Bourdain appeared to arrive with a bit of a vague, Old West, gun-toting caricature of the state, I can attest that some of those scenes got brainstormed on the fly. I joined them on the second day of shooting, after they had already done a scene riddling the New Mexico landscape with bullet holes, and another in the Santa Fe Plaza that, when the show aired, gave the locals myopia about the entire rest of the episode. Our scenes began with a horseback ride along the Ghost Ranch cliffs behind Georgia O’Keeffe’s house. Then we did a red canyon cook-out under a full moon, where Bourdain prepared a meal for him and me and three generations of a local Spanish-American family. A horseback conversation about a modern, sophisticated New Mexico didn’t clear the cutting room. Tony and I were mic’d up for nine straight hours, and when I later watched the rough cut, one of Tony’s traits that had struck me was confirmed. A writer alert to good lines, he had plucked several things I’d said—about O’Keeffe, the Ghost Ranch landscape, New Mexico history—for his voice-over narration. The crew had a Route 66 scene to do—Tony cruising the High Desert in a 1964 drop-top Ford Galaxie—the next day. But our Ghost Ranch conversations had given me a sense that Bourdain could use help, so before we left Ghost Ranch I gave him a copy of my 1999 book, Horizontal Yellow: Nature and History in the Near Southwest, and suggested that maybe a quick scan of one particular chapter might flesh out New Mexico. Two days later, when we did the scene where Bourdain and I shared a meal in Horseman Haven’s Café featuring “level three” Hatch chiles (“Defcon three, two, one . . .”), Bourdain revealed that he’d read the entire book. It had occured to him to add a Zia Pueblo scene, and I like to think I played some role in the episode’s final characterization of modern New Mexico as not just multi-cultural, but a place where Americans were creating an entirely original relationship to the universe. Bourdain generously promoted Horizontal Yellow in the show and on the CNN website, the Bourdain Effect for companions on his shows. Spending a few days with Tony didn’t exactly make us forever friends. I liked and enjoyed him, appreciated that he threw himself willingly into things, including late night clean-up after the camp meal. He was respectful of New Mexico chiles, too, once he recovered his ability to speak: “half a shot glass of that stuff would put you in a hospital!” As a New Yorker he simply could not wear a cowboy hat when we rode, though. Nor did we ever hang out and swill beers. I had the sense that in his life, new people and places were simply coming and going too endlessly. Dan Flores’s most recent article in New Mexico Magazine is “The Four-Legged Dude” in the June 2018 issue.